You will have seen from the letters columns in issues 2 and 3 that there is still some lack of understanding about the aims of this magazine. I have a strange mixture of feelings about this. 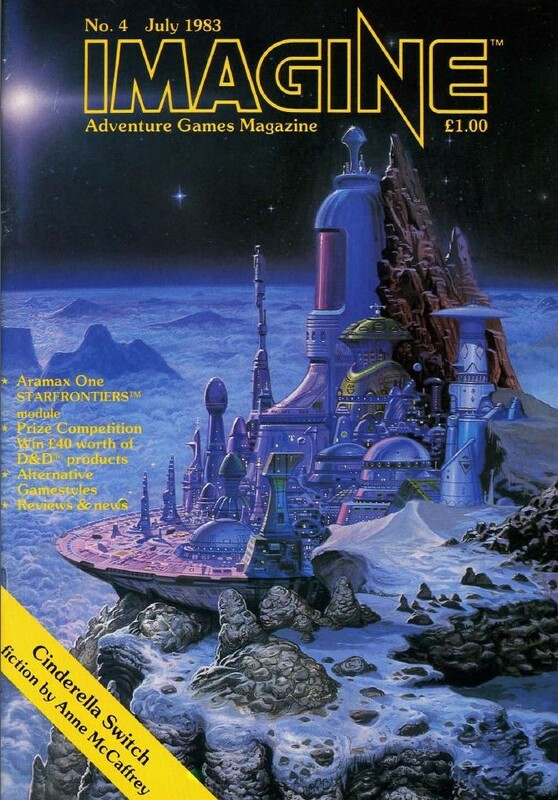 Sadness that some of our friends still feel that they are not being catered for and joy that so many people not only like the magazine but are being introduced into the adventure gaming world and indeed into the ranks of the Players Association. All you experienced players who are concerned about there being too many basic details in this magazine should be delighted that we allocate space to the newcomer, for he or she keeps the hobby alive and, with time, they too will develop into experienced players. I find the editorial fascinating for several reasons, the first being that it really does reflect some of the hobby's growing pains that I experienced even on the other side of the Atlantic. By 1983, I'd been gaming for close to four years and, though only nearly-fourteen years-old at the time, I was nevertheless resentful of the "kiddies" who were entering the hobby, especially after the release of the hated (from my perspective) Mentzer-edited versions of D&D. It was absurd that I felt that way, but I did, so Thomson's editorial strikes a familiar chord. Secondly, it's a reminder that, in mid-1983, the hobby was still expanding. Ironically, I think the rot that would later set in had to do with catering ever more to the experienced players rather than continuing to look for new ways to bring in new blood. The temptation, when taking on the challenge [of refereeing --JDM] for the first time, is to let someone else do much of the hard work by buying a pre-designed module and running that, thus avoiding all the work of drawing up a dungeon. Personally, I don't think is really the best idea. Musson goes to offer several reasons why he doesn't think it "really the best idea," not least of which is that "drawing up a dungeon" -- how I love that phrase -- gives a neophyte referee insights into how to run and use others' creations. 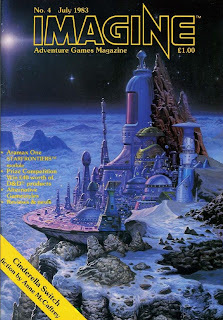 I couldn't agree more, but it's the kind of advice one doesn't expect to see in an official TSR publication, since, moreso than any company, TSR was responsible for pushing the pre-packaged adventure module as a "necessity" for playing their games. Paul Mason's "Alternative Game Styles" briefly discusses various approaches to roleplaying (educational, psychological, etc.) and the benefits of using them. There's a bit of fiction by Anne McCaffrey, entitled "Cinderella Switch." Brian Creese provides "An Introduction to the Postal Games Hobby." Though short, the article brought back a lot of memories, since play-by-mail gaming is one of those things that was thriving when I entered the hobby and is now virtually extinct, though I suppose one could make the argument that forum-based gaming occupies a similar place nowadays. It is not, however, an argument to which I give much credence, though. I find myself returning again and again to the same basic belief -- the gaming hobby is fun, and it's there for enjoyment. Hang the realism -- give me a game I can enjoy at any time. There's another installment of the (to me) baffling comic "Rubic of Moggedon" and some film reviews (of The Dark Crystal and Q -- The Winged Serpent) by Colin Greenland. Peter Tamlyn's "Tavern Talk" continues to talk about the local gaming scenes, but also includes a brief aside about "the profusion of ®, ™, and © marks that are attached to every TSR product name." Again, this reminds me of similar discussions I heard back in the day and it's a reminder of another fact: by 1983, TSR was already well on its way to becoming the "T$R" so roundly despised by the late '80s and early '90s. Doug Cowie provides some reviews of D&D modules (I2, I4, and M1) that are largely positive, while Robert Hulston talks about a British RPG called Starstone. The name rings a bell with me, but I don't believe I have ever seen it. Has anyone else? There are the usual assortment of letters, fanzine announcements, and club notes in this issue, all of which, I think, contribute to my sense that Imagine was a much more "grounded" gaming magazine than almost any of those I read regularly as a younger person. I like that. Finally, Ian Williamson's "The Sword of Alabron" appears once more. I really enjoyed issue #4 of Imagine. I think it has a very unique voice, one that not only differentiated it from other gaming magazines at the time, but one that said a lot worth listening to. It's a pity that I never got to see it at the time and even more of a pity that, eventually, that unique voice was stifled. Comments about this post can be made here.